One of the most celebrated humorists (writers of clever humor) and public figures of his day, Will Rogers offered dry, whimsical commentaries on a variety of political, social, and economic issues, and he became the voice of the "average" citizen. 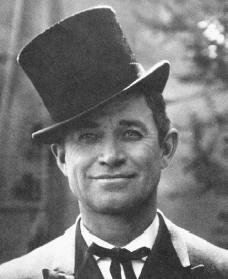 Will Rogers was born on September 5, 1879, to Clement and Mary Rogers. The youngest of eight children, Will was raised in a wealthy and privileged family on a ranch near Claremore, Oklahoma, which was then Indian Territory. His father, Clement, a rancher and farmer, was also a sharp businessman and an influential politician. Although Rogers loved his father, their strong personalities often led to conflict. His relationship with his mother was loving and affectionate, and when she passed away, ten-year-old Rogers was devastated. Rogers was one-quarter Cherokee and liked to boast that this heritage, combined with his early experience as a cowboy, made him the ideal example of the American citizen. His early adult years were spent between working on the family ranch and traveling the world, and it was in South Africa that Rogers began his performing career with a Wild West show as a trick rider. He later joined a circus, then back in the United States, he worked in another Wild West show, which eventually led to a job in vaudeville, a theater style that used a variety of acts. In vaudeville he added to his performances with off beat lectures on the art of roping. Rogers's humorous chatter, casual delivery, and southwestern drawl proved a popular combination, resulting in an invitation to join the popular Ziegfeld Follies on Broadway. He delighted audiences with his homely philosophy (the study of knowledge) and sharp remarks, becoming a renowned humorist and interpreter of the news. company, but when this failed he was forced to return to New York City and the Ziegfield Follies. Three years later the first two collections of Rogers's humor appeared— The Cowboy Philosopher on the Peace Conference and The Cowboy Philosopher on Prohibition, both published in 1919. The Cowboy Philosopher on the Peace Conference poked fun at the political activities surrounding the Versailles Treaty (signed in 1919, the treaty helped settle matters following World War I [1914–18]). The second volume ridiculed the Eighteenth Amendment to the U.S. Constitution, passed in 1919, which outlawed the sale and consumption of alcohol. Rogers posed as the cowboy philosopher, a rural American gaping wide-eyed at the shenanigans of a modern world run by crooked businessmen and dishonest politicians. Yet although Rogers's brand of popular humor appealed to the average citizen, he himself became a part of the establishment he made fun of. He befriended members of Congress as well as business leaders and at one time publicly supported the Fascist regime of Italian dictator Benito Mussolini (1883–1945), who ruled Italy with a cruel and iron fist. Rogers, as quoted by James Feibleman in In Praise of Comedy: A Study in Its Theory and Practice, once stated that he wished his gravestone to read, "I joked about every prominent man of my time, but I have never met a man I didn't like." Rogers began a secondary career as an after-dinner speaker, and his success led in 1922 to a syndicated weekly newspaper column. The first two years of these columns were collected in the 1924 book The Illiterate Digest. The columns showcase the cutting criticisms Rogers aimed at government, the influence of big business, and the then-popular topic of world disarmament (to reduce weapons) in the aftermath of World War I (1914–18). Rogers next moved onto the international stage of political humor. The Saturday Evening Post sent him abroad and his columns from Europe were collected in Letters of a Self-Made Diplomat to His President, published in 1926. The articles were published in the magazine in the form of fictional letters to then-president Calvin Coolidge (1872–1933) and were full of humorous advice to the chief executive from Rogers's European observations. The next leg of the journey for the Post took Rogers to the Soviet Union, the former country that today is made up of Russia and several smaller nations, and his columns about this experience appeared in There's Not a Bathing Suit in Russia. This 1927 volume chronicles his trip to the world's first Communist government, a political system where the goods and services are owned and distributed by a controlling central government. During this period Rogers further expanded into another media—the growing field of radio. He gave his first broadcast over the airwaves in 1926 and by 1930 had his own weekly slot. Like each of his speeches and syndicated columns, the radio speeches centered on a topic of current interest and were filled with Rogers's stories and sharp commentary on the issue. By the end of the 1920s Rogers was using his position in the spotlight to campaign for humanitarian causes (causes that improve the life of others). During devastating flooding along the Mississippi River in 1927, he visited the ravaged areas, gave special performances and donated the proceeds to flood victims, and testified before Congress supporting increased disaster aid to the area. The year 1929 dealt a severe blow to the American frame of mind—in October the stock market crashed and the country was plunged into a deep economic depression, putting millions out of work. Rogers continued in his role as the foremost humorist of the nation's "little people" in his radio broadcasts and journalistic essays. In one piece, quoted by E. Paul Alworth in Will Rogers, he wrote: "Now everybody has got a scheme to relieve unemployment, but there is just one way to do it and that's for everybody to go to work. 'Where?' Why right where you are, look around and you see lots of things to do, weeds to be cut, fences to be fixed, lawns to be mowed, filling stations to be robbed, gangsters to be catered to.…" Rogers supported the radical transformations President Franklin D. Roosevelt (1882–1945) began under the New Deal beginning in 1933. The celebrity spoke out in favor of lending a helping hand to those affected the most by the economic situation and again gave benefit performances. He continued to star in films and indulged in his passion for airplanes. In August of 1935 a small plane carrying Rogers and a pilot friend, on their way to survey air routes from the United States to the Soviet Union, crashed over Point Barrow, Alaska, killing the entertainer. Rogers was fifty-five. His death was an occasion of national mourning. Newspapers and radio commentators praised him, a memorial was dedicated near his Oklahoma birthplace, and several volumes of his speeches, essays, broadcasts, and sayings appeared in print. Will Rogers is remembered as one of the best-loved celebrities of his era and one of the twentieth century's best-known humorists. Forty years after his death, collections of his essays and quips were still appearing in bookstores. Alworth, E. Paul. Will Rogers. Boston: Twayne, 1974. Brown, William R. Imagemaker: Will Rogers and the American Dream. Columbia: University of Missouri Press, 1970. Keating, Francis Anthony. Will Rogers: An American Legend. New York: Harcourt, 2002. Rogers, Will. The Autobiography of Will Rogers. Edited by Donald Day. New York: AMS Press, 1979. Yagoda, Ben. Will Rogers: A Biography. New York: Knopf, 1993. You may want to double check the date that you have listed for Will Rogers birth. The research that I did unanimously listed his birthday as November 4, 1879. He referred to the date as having been born on election day. and his birthday is NOT in September it is in November. If you didn't get that right what makes you think I'm going to believe the rest is true?